James R. Wertz, Microcosm, Inc.
Chapter 6 lists several references on astrodynamies. Unfortunately, very few of these references contain any discussion of the orbit selection or design process. Chobotov  and Vallado  have some information. By far the most extensive discussion of this topic is in Wertz . Soop  contains an excellent discussion of the design of geostationary orbits. Ordinarily, spacecraft will be in various orbits during the space mission life. These could include, for example, a parking orbit for spacecraft checkout or storage, a transfer orbit to move it from the injection orbit where the spacecraft separated from the launch vehicle to its operational orbit or orbits for mission activities, and possibly a final disposal orbit where the spacecraft will do minimum damage when we are through using it In early mission design, we pay most attention to defining the spacecraft's operational orbit. However, preliminary mission design needs to consider all mission phases to meet the needs of more complex missions. Orbit design has no absolute rules; the method described below and summarized in Table 7-1 gives a starting point and checklist for the process. TABLE 7-1. Summary of the Orbit Selection Process. See text for discussion of each step. 2. Determine orbit-related mission requirements. 3. Assess applicability of specialized orbits. 4. Evaluate whether single satellite vs. constellation is needed. 6. Assess launch and retrieval or disposal options. 7. Evaluate constellation growth and replenishment (if applicable). 9. Document orbit parameters, selection criteria, and allowed ranges. Iterate as needed. Effective orbit design requires clearly identifying the reasons for orbit selection, reviewing these reasons regularly as mission requirements change or mission definition improves, and continuing to remain open to alternatives. Several different designs may be credible. Thus, communications may work effectively through a single large satellite in geosynchronous orbit or a constellation of small satellites in low-Earth orbit. We may need to keep both options for some time before selecting one. • Parking Orbit—a temporary orbit which provides a safe and convenient location for satellite checkout, storage between operations, or at end-of-life. Also used to match conditions between phases such as post-launch and pre-orbit transfer. • Transfer Orbit—used for getting from place to place. Examples: transfer orbit to geosynchronous altitude; interplanetary oibit to Mars. • Space-referenced Orbit—an operational oibit whose principal characteristic is being somewhere in space (specific orbit parameters may not be critical). Examples: Lagrange point orbits for space sampling and observations; orbits for celestial observations or space manufacturing. • Earth-referenced Orbit—an operational orbit which provides the necessary coverage of the surface of the Earth or near-Earth space. Examples: geosynchronous satellites, low-Earth satellites for Earth resources, meteorology, or communications. For each mission segment, we define the orbit-related requirements. They may include orbital limits, individual requirements such as the altitude needed for specific observations, or a range of values constraining any of the orbit parameters. Section 7.4 discusses in detail the requirements we would follow in designing an operational orbit Ordinarily, these multiple requirements drive the orbit in different directions. For example, resolution or required aperture tend to drive the orbit to low altitudes, but coverage, lifetime, and survivability drive the spacecraft to higher altitudes. Selecting of parking, transfer, and space-referenced orbits is normally conceptually simpler, although it may be mathematically complex. Here the normal trade is meeting the desired constraints on a mission, such as lifetime, thermal, or radiation environments, at the lowest possible propellant cost. Section 7.5 discusses the key mission requirements for these orbits. In selecting the orbit for any mission phase, we must first determine if a specialized orbit applies. Specialized orbits are those with unique characteristics, such as the geostationary ring in which satellites can remain nearly stationary over a given point on the Earth's equator. We examine each specialized orbit to see if its unique characteristics are worth its cost This examination precedes the more detailed design trades, because specialized orbits constrain parameters such as altitude or inclination, and thus often lead to very different solutions for a given mission problem. Consequently, we may need to carry more than one orbit into more detailed design trades. The principal advantage of a single satellite is that it reduces cost by minimizing the mission overhead. Thus, one satellite will have one power system, one attitude control system, one telemetry system, and require only a single launch vehicle. A constellation, on the other hand, may provide better coverage, higher reliability if a satellite is lost, and more survivability. We may also need a constellation to provide the multiple conditions to carry out the mission, such as varying lighting conditions for observations, varying geometries for navigation, or continuous coverage of part or all of the Earth for a communications constellation. To meet budget limits, we must often trade a single large satellite with larger and more complex instruments against a constellation of smaller, simpler satellites. This decision may depend on the technology available at the time of satellite design. As small satellites become more capable through miniaturized electronics (Chap. 22) and onboard processing (Chap. 16), we may be able to construct constellations of small, low-cost satellites, frequently called LightSats, that were not previously economically feasible. Another major cost element for large constellations is die operational problem of providing continuous navigation and control. The introduction of low-cost autonomous navigation and control (See Sec. 11.7) should promote larger constellations of small satellites in the future. The next step is to select die mission orbit by evaluating how orbit parameters affect each of the mission requirements from Table 7-6 in Sec. 7.4. As the table shows, orbit design depends principally on altitude. The easiest way to begin is by assuming a circular orbit and then conducting altitude and inclination trades. (See Sec. 7.4 and the example in Sec. 3.3.1.) This process establishes a range of potential altitudes and inclinations, from which we can select one or more alternatives. Documenting the results of this key trade is particularly important, so we can revisit the trade from time to time as mission requirements and conditions change. If a satellite constellation is one of the alternatives, then phasing the satellites within that constellation is a key characteristic, as Sec. 7.6 describes. Note that constellations of satellites are normally at a common altitude and inclination because the orbit's drift characteristics depend largely on these parameters. Satellites at different altitudes or inclinations will drift apart so that their relative orientation will change with time. Thus, satellites at different altitudes or inclinations normally do not work well together as a constellation for extended times. Chapter 18 discusses satellite launch systems in detail. The launch vehicle contributes strongly to mission costs, and ultimately will limit the amount of mass that can be placed in an orbit of any given altitude. As we define the mission early on, we must provide enough launch margin to allow for later changes in launch vehicles or spacecraft weight Naturally, new designs require more margin than existing ones, with 20% being typical for new missions. Although given little consideration in the past, retrieval and disposal of spacecraft have become important to mission design (Sec. 21.2). Spacecraft that will reenter the atmosphere must either do controlled reentry, burn up in the atmosphere, or break up into harmless pieces. If the spacecraft will not reenter the atmosphere hi a reasonable time, we must still dispose of it at the end of its useful life so it is not hazardous to other spacecraft This problem is particularly acute in geosynchronous orbit where missions compete strongly for orbit slots. * As Sec. 21.2 points out, a collision between two spacecraft not only destroys them but also causes debris dangerous to their entire orbit regime. * Cefola  gives an excellent analysis of the requirements for removing satellites from geosynchronous orbit only from low-Earth orbit In the future, it would be desirable to retrieve satellites as far away as geosynchronous orbit and return them to either the Orbiter or Space Station for refurbishment, repair, disposal, or reuse. An important characteristic of any satellite constellation is growth, replenishment, and graceful degradation. A constellation that becomes operational only after many satellites are in place causes many economic, planning, and checkout problems. Constellations should be at least partly serviceable with small satellite numbers. Graceful degradation means that if one satellite fails, the remaining satellites provide needed services at a reduced level rather than a total loss of service. Section 7.6 discusses further the critical question of how we build up a constellation and how to plan for graceful degradation. To numerically evaluate the cost of an orbit, we must create a A V budget for the orbit, as described in Sec. 7.3. This then becomes the major component of the propel-lant budget as described in Sec. 10.3. A key component of orbit or constellation design is documenting the mission requirements used to define the orbit, the reasons for selecting the orbit, and the numerical values of the selected orbit parameters. This baseline can be reevaluated from time to time as mission conditions change. Because mission design nearly always requires many iterations, we must make the iteration activity as straightforward as possible and readdress orbit parameters throughout the design process to ensure they meet all requirements. * Throughout this section we will use instrument to refer to any spacecraft sensor or antenna for which we want to compute coverage. Rg. 7-1. The Instrument Footprint or FOVla the Instantaneous Region on the Ground Being Covered. The instantaneous access area is the total area in view. nearly stationary relative to the Earth's surface. In low-Earth orbit, satellites are moving rapidly over the surface, so the rate at which new land appears is usually critical. * Instantaneous Access Area (IAA) = all the area that the instrument or antenna could potentially see at any instant if it were scanned through its normal range of orientations. • Area Coverage Rate (A.CR) = the rate at which the instrument or antenna is sensing or accessing new land. * Area Access Rate (AAR) = the rate at which new land is coming into the spacecraft's access area. For an instrument which covers all of the area available to it as the spacecraft moves along, the coverage rate and access rate will be the same. For instruments operating only part of the time or continuously selecting the region to be examined, the coverage rate and access rate may be dramatically different Generally the access area and access rates depend only on the orbit and limiting geometry of the system, so we can easily compute them with only a minimal knowledge of the detailed system design. On the other hand, the actual area coverage rate during spacecraft operations may well depend on the spacecraft control, power, and management systems, as well as the details of mission operations. Coverage assessment conveniently divides into two areas: first, an analytic assessment to provide approximate formulas for coverage parameters as a function of mission variables; second, numerical simulations to provide coverage Figures of Merit for more detailed studies. In this section we present analytic approximations for various Earth coverage parameters. 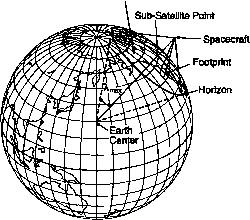 All of the formulas here take into account the spherical surface of the Earth, but do not account for oblateness, or the rotation of the Earth underneath the orbit These effects, in addition to those of coverage by multiple satellites, are ordinarily accounted for in numerical simulations as described in Sec. 7.2.2. All of the formulas here are derived directly from the single-satellite geometry described in Sec. 5.2. In particular, we will use the notation developed there and summarized in Fig. 5-13 in Sec. 5.2. In this section we will parameterize coverage in terms of the Earth central angle, A. * However, we can use Eqs. (5-24) to (5-28) to transform each of the formulas below into one for either the spacecraft-centered nadir angle, r\, or spacecraft elevation angle, 6, seen from the ground. The length (also called the height) of the footprint, LF, is given by where the variables are defined in Fig. 7-2 and, for A expressed in degrees. * A may be thought of either as an angle at the Earth's center or as a distance measured along the Earth's surface. We will use these two views interchangeably as convenient for the problem at hand. Note: The linear approximation given in Eq. (7-lb) is computationally convenient but can be very inaccurate, particularly near the horizon where £is small. (For a satellite at an altitude of 1,000 km with a 1 deg diameter beam, the error in Eq. (7-lb) is 400% at e= 1 deg, 10% at £= 15 deg, and 1% at £=60 deg.) However, the alternative computation of Eq. (7-la) is much less convenient To find the footprint length for a given spacecraft elevation angle at the toe of the beam, e, we begin by computing 7} and A at the toe, then subtract the beam width, 0, from 7j to determine t] at the heel, compute A at the heel, and Anally subtract to get the footprint length from Eq. (7-la). An alternative that improves the approximation somewhat is to use the center rath» than the toe of the beam. Because die toe represents the worst-case link budget (see Chap. 13), it is most often used for performance computations and, therefore, is commonly used for geometry calculations as well. where Rg = 6,378.14 km is the radius of the Earth, 0 is the beam width, and D is the distance from the spacecraft to the toe of the footprint* Here the error in the approximation in Eq. (7-2b) is proportional to 1 - (WF/sin WF)1 and is generally small relative to other errors. Thus, Eq. (7-2b) is adequate for most practical applications. Assuming that LF was computed by Eq. (7-la), the error in ignoring the curvature of the Earth in Eq. (7-3) is again proportional to 1 - (Wf/ sin Wp) and is negligible for most applications. * In the case of a noncircular beam, Eq. (7-1) can be used with the beam width, 0, perpendicular to the horizon and Eq. (7-2) can be used independently with the beam width parallel to the horizon. t Here WF should be expressed in radians as seen from (he center of the Earth. Computing the instantaneous access area, IAA, will depend on the shape of the potential coverage area on the ground. Figure 7-3 shows several typical shapes. Hie most common of these is Fig. 7-3A, which assumes that the instrument can work at any point on the Earth within view for which the spacecraft elevation is above e. This corresponds to a small circle on the Earth of radius A centered on the current sub-satellite point. 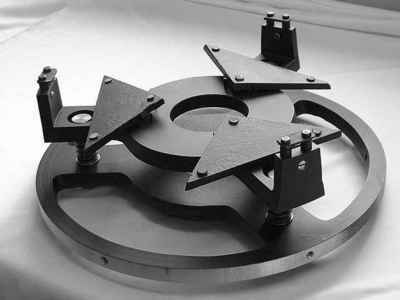 Some instruments, such as radar, cannot work too close to the subsatel-lite point. As Fig. 7-3B shows, these instruments have both an outer horizon, Aj, and an inner horizon, Ag. Fig. 7-3. Typical Access Areas for Spacecraft Instruments. See Table 7-2 for formulas. The instantaneous access areas or access lengths for the other patterns in Fig. 7-3 are given in Table 7-2, which also summarizes all of the coverage formulas for these patterns. 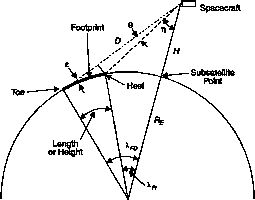 These access area formulas do take into account the curved surface of the Earth and are accurate for any access area size or satellite altitude to within very small corrections for the Earth's oblateness. TABLE 7-2, Coverage Formulas for Patterns Shown In Fig. 7-3. See text for definition of variables. In pattern D, the minus sign applies if A2 is on the same side of the ground track as Ar The approximation for footprint area is invalid when e=0. The ACR formulas for patterns C and P assume that the Instrument is side-looking. P is the orbit period.